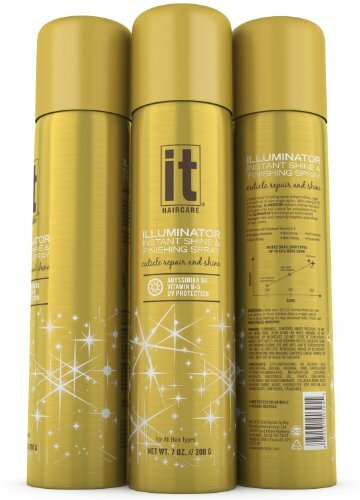 IT Illuminator Instant Shine Spray by IT Hair Care, Amazing Cuticle Repair Through State Of The Art ECV151 Complex, Abyssinian Oil, Vitamin B-5, Ultimate Shine & UV Protection, Revives Damaged Hair Including Breakage and Split Ends 7 Ounce Can - Luxury Beauty Care Products ! Illuminator Instant Shine and Finishing Spray With new EVC151 Technology, Illuminator delivers intense hydration as it seals the hair cuticle for unbeatable shine. The Illuminators exclusive proteins rebuilds damaged hair and instantly brightens and refreshes all hair colors. Crystal clear finishing spray delivers shine, repair and hold all in one single action. Brilliant Instant Shine and Hair Repair. Guaranteed Up To 98% More Shine!! RICH Hair Care Pure Luxury Energising Matte Texture Paste, 2.70 oz.